The River Thames feels familiar yet unknowable. The reflections, ripples and its cold dark tide seem only to reveal glimpses of what lies beneath. Liminal is an architectural painting which blurs the boundaries between 2D, 3D and 4D. Liminal is 6.5m x 4.5m x 0.7m and behaves like a kaleidoscopic lens reflecting and refracting the ever-changing ambient light and river. 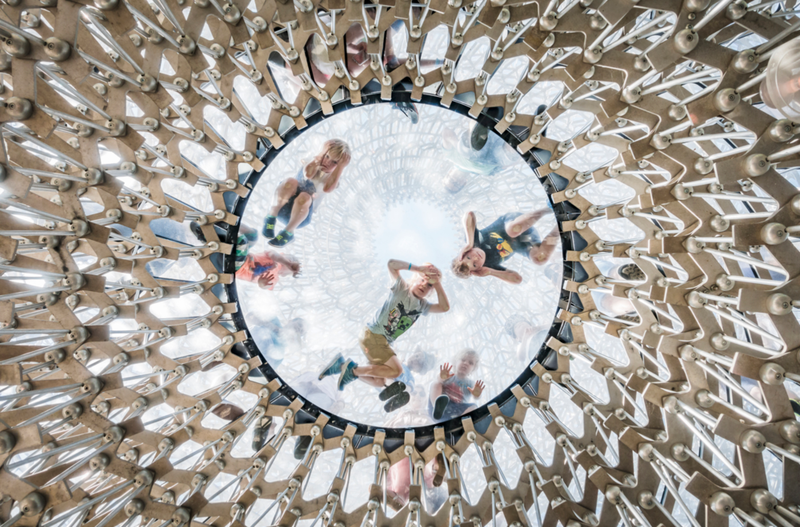 The faces of the lens are made from a variety of mirror, bright, satin and matt polished aluminium panels which will focus and alter the viewers perception and experience of the river depending on which angle the installation is looked at and through. Using a combination of a solar powered sonar device and a recently developed app that my team have designed I am keen to explore what happens on and beneath the surface of the river and express this unseen and imagined world through an ever-changing light field and soundscape through the audience’s smart phone. I will create a multi-sensory installation which would act as a conduit or lens to make real time connections between the audience and the water. The artwork will be emotionally engaging; hopefully inspiring people to pause, reflect and experience the power, beauty and mystery of the River Thames. This site-specific installation integrates art, architecture, landscape, science and sound to create a meeting space and an inclusive connective experience for individuals or events. It allows the audience to be in the moment as well as create a portal to something which is both hidden and timeless. As part of the London Festival of Architecture, Liminal will be installed in June 2019 along the River Thames opposite Tate Modern.